Columbus Day weekend--what an incredible time! This past weekend's toughest decision was deciding if I wanted to kayak, camp, or hike. I dodged the dilemma and decided to do them all. 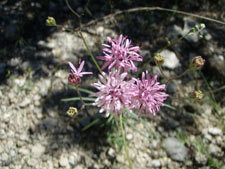 Friday's weather and lack of precipitation made for a comfortable seven-mile hike at Government Canyon State Natural Area. 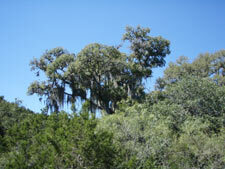 Government Canyon State Natural Area is a day use only 8,624 acre natural area just outside San Antonio. 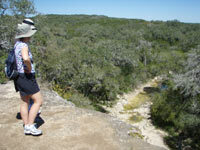 The area is perfect for hiking and mountain biking - a number of different trails, plenty of wildlife, a wide variety of different trees and fauna, steep slopes that provide scenic overlooks of the surrounding Bexar County and glimpses of San Antonio, and several rare birds. The trails are well worn and well marked and the elevation changes and terrain can be strenuous but there is a good mix of flatter creek bottom and rocky ridge trials - you can pick one that's suitable for you.. For mountain bikers, the back country part of the park is where the fun riding is - very rocky with technical climbs and descents in a Texas hill country environment. There are beginner mountain bike trails in the lower section of the park. My wife packed a healthy lunch; I packed the G2 and waters; and my son packed a good attitude (that's all I asked). We headed out from the park headquarters to journey northward along the Joe Johnson Route. 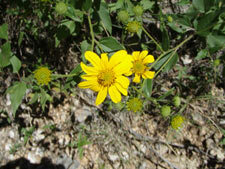 As the hike got farther into the hill country, we saw a healthy variety of wildflowers and moss-laden oaks. We spent about three hours in the park talking, pacing, and just being with each other. It was a good family time with memorable conversation and photos to inspire another trip. I hope to return this winter to head in for a longer hike - a glimpse of which you can see on the far right picture below. As Friday passed and we rested, I had plans to assist Herb Nordmeyer on Saturday morning. 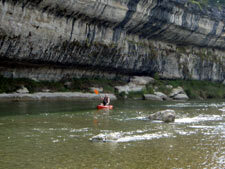 He guides kayak paddle groups all over Texas but this day's trip was in Bastrop, Texas along the Colorado River. Herb owns Texas Nature Kayaking and he caters to folks of all ages who want to experience nature from the seat of a kayak. Simply stated, "Herb is good people." I knew I needed a good night's sleep if I would be of any use to Herb. I got into Bastrop at about 9:00 AM on Saturday morning. 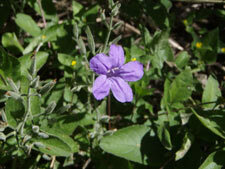 I met Herb just off Main St. at Bastrop's city park. We unloaded all the kayaks and gear to prepare our launch from there. The rest of the crew arrived anxious to paddle the 6.4 miles along the El Camino Real Loop paddle trail. Herb hollered out, "Craig--you're in the lead." I paddled ahead enjoying the Colorado's cold water and healthy flow. There were 12 kayaks in our group and nobody was in a hurry to get down river. We strolled along at a leisurely paddle where we sought comfort in some of the larger eddies to let other groups paddle by. The river's wide channel narrowed in a few areas to carry us through some very mild rapids. 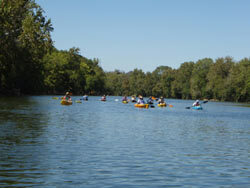 No worries--the water was perfect for beginners seeking a slow-paced kayak experience. If you measure success by the presence of laughter and good times, this was a great success. 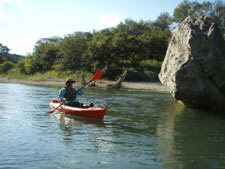 Click on the link to read a more detailed description on this great Texas Paddling Trail. Sunday called for an impromptu decision to go camping. 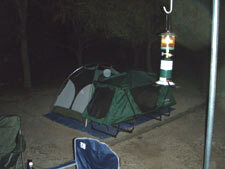 My wife and I packed up for a night at the Guadalupe River State Park. We love Guadalupe River State Park because it has some great campsites, 3 miles of hiking trails, 5 miles of equestrian and mountain biking trails, and over a mile of river access for fishing, kayaking, swimming, tubing, or just sitting on the bank watching the river flow by. Our first order of business was to pick a campsite when we got there. After a brief drive and study of the grounds, we picked our spot and headed to the river for some paddle-time. The river was flowing low with a comfortable current of 100 cubic feet per second (cfs). 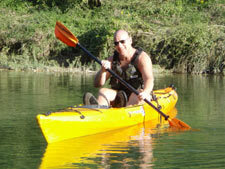 I took two of my kayaks to help my bride build some paddling skills. The river's flow was low and the hazards were minimal. She agreed and paddled upstream with me where we had a blast. That night ended with the traditional ceremony of roasting marshmallows over an open campfire. It was "lights out" soon after that. As the night became morning I must admit I slept pretty good. My wife said she was a bit restless but an air mattress made it worthwhile for her. We packed up and headed home. I thought to myself, where did the four days of this long weekend go? I realized I hiked, paddled, camped, and spent a lot of time with my family. No regrets! I love Texas.